Everything you need to kickstart your YouTube career in a single handy box! Here's another one to add to our best Black Friday camera deals. The GoPro Hero5 is a great 4K action cam and here it's bundled with everything you need to get started, and all for just £249.99 – that's a saving of £79. The Hero5 Black shoots 4K UHD video at up to 30fps, it's waterproof down to a depth of 10m and it has a 2-inch touchscreen. The big story here, though is the accessory bundle you get with it, which includes a 'Casey' carry case, a 'Shorty' mini-tripod and extension pole and a 16GB memory card. 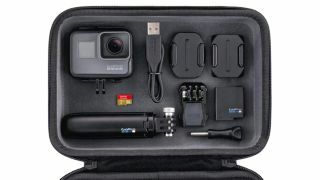 It's one of the best GoPro offers and one of the best ways to get started – and with the big-name brand that practically invented this whole action cam genre.